Thomson Reuters is extremely pleased to announce that Professor Michael Legg has joined the Journal of Civil Litigation and Practice as its new co-General Editor, working alongside the current General Editor Roderick Joyce QSO QC. A Professor of Law at UNSW Sydney, Michael is a legal practitioner with over 20 years of experience and has worked with leading law firms in both Australia and the US. Some of his cases include class actions brought by travel agents based on allegations of misleading conduct and breach of contract; the successful defence of a Fortune 500 company facing novel class actions in the US state courts of West Virginia and Texas; and defence of cartel proceedings brought by the Australian Competition and Consumer Commission. Michael is the Director of the IMF Bentham Class Actions Research Initiative at UNSW Law. He is also Director of the Law Society of NSW Future of Law and Innovation in the Profession (FLIP) research stream in the Allens Hub for Technology, Law and Innovation at UNSW Law, having played a key role as the academic committee member on the ground-breaking FLIP Report launched by the Law Society of New South Wales in March 2017. Michael’s areas of expertise include class actions, litigation funding, regulatory litigation, corporate and securities law, the US legal system, and comparative civil procedure. His research, which include interests such as complex civil litigation, dispute resolution, the impact of cost and delay on the civil justice system, and regulators’ investigatory powers, has been cited in judgments by the Federal Court of Australia, Supreme Court of New South Wales and the Supreme Court of Victoria, and in law reform reports spanning the Australian Law Reform Commission, NSW Law Reform Commission and Victorian Law Reform Commission. A member of the Law Society of New South Wales’ Future Committee, the Law Council of Australia’s Class Actions Committee and a Board Member of the Australian Pro Bono Centre, Michael’s interests extend to access to justice, community needs, and the impact of technology on the legal profession and the way in which it is shaping legal education. Michael is co-author on The Future of Australian Legal Education: A Collection (forthcoming release June 2018) based on the Australian Academy of Law Conference of the same name, at which he presented last year, and has also co-authored Civil Procedure in New South Wales (Thomson Reuters, 3rd ed, 2015) and Annotated Class Actions Legislation (LexisNexis, 2nd ed, 2018). He is also the editor of Regulation, Litigation and Enforcement (2011) published by Thomson Reuters, and The Future of Dispute Resolution (2013) and Resolving Civil Disputes (2016) by LexisNexis. Aside from working on JCivLP, Michael has also published in other Thomson Reuters Journals such as the Australian Law Journal, Australian Business Law Review, Australasian Dispute Resolution Journal, Journal of Banking and Finance Law and Practice, and Public Law Review. 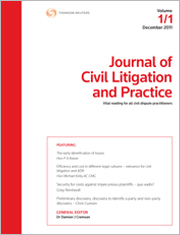 The Journals Team warmly welcomes Professor Legg to the Journal of Civil Litigation and Practice, and looks forward to his insights and ideas in helping readers to navigate the current and future landscape of civil litigation and procedure in Australia and beyond.